Over the course of three shows at City Winery, John Darnielle gave his Mountain Goats bandmates a subtle but meaningful tribute that you would have missed if you were not paying close attention. For the first song of each of the three John “solo” segments in each show, a different band member was featured in a duo with the band’s protagonist. On Sunday, Matt Douglas played sax on “Foreign Object”, on Monday Peter Hughes played bass on “Jenny”, and for this Tuesday night finale of the residency, Jon Wurster joined John for a cover of Dio’s “Rainbow in the Dark” — a song Darnielle revealed that Wurster had never played before this performance. These are some of the little things that bring the fans back to see the Mountain Goats time and again. 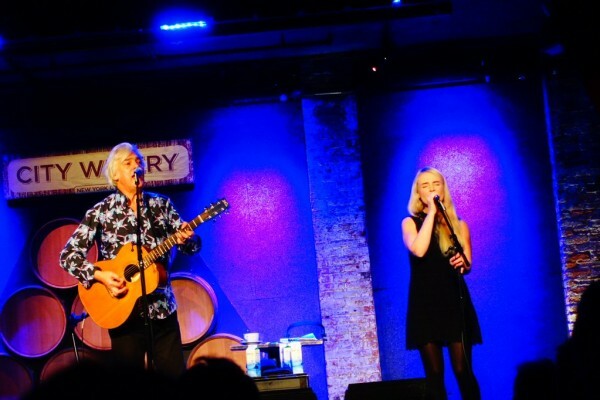 There were many fans who attended each of the three nights at City Winery and perhaps other East coast shows. What brings them back night after night isn’t just the promise of different and sometimes rare songs at any given show, or the often hilarious banter, or the chance to hear their favorite songs — the most compelling aspect of the Mountain Goats experience is the feeling of belonging. There is a strong sense of unity within the band, between the fans, and between the fans and band. The music offers a sense that no matter how difficult things are for you, there are people out there who know what you’ve endured and can tell you from experience that you’re going to be alright. The final night of this special set of shows became the “celebratory” performance in large part because this particular crowd was quite rambunctious. And John rewarded the energy with a couple of first-time covers and a few songs that had yet to appear on this tour. In particular “Cobscook Bay” and “Nine Black Poppies” were familiar but welcome additions to the tour itinerary, both not having appeared on a setlist since last year. For a final night of the tour and likely the last NYC Mountain Goats show until 2017, this show was exactly what we’d hoped to experience. I recorded this set in the same manner as the previous night and the sound quality is equally superb. Enjoy! As noted in our review of the New Haven show, the concept of this Mountain Goats tour grew up around the band’s City Winery gigs of last year, of which we recorded both. That the band found inspiration in this particular room isn’t surprising; while some younger fans may not be used to seeing bands in more sedate environments, this venue must be an absolute dream for any performer who plays a wide dynamic range of music and whose fans hang on every word. The Mountain Goats took the stage at one of last year’s shows not with the type of upbeat number you’d need to launch a typical club gig, but with the gorgeous “Get Lonely,” which set the tone for an evening of wide-ranging sounds and deep catalog dives. Yes, the pro-wrestling-themed Beat the Champ made a few appearances, including a stripped-down take on “Foreign Object” and an inspired “Werewolf Gimmick,” and an encore of “Southwestern Territory,” but the deep dives were the real meat of the evening. John Darnielle reached all the way back to 1993 for “Water Song II,” followed by “Horseradish Road,” from 2000’s Coroner’s Gambit, played so rarely of late that Darnielle skipped a verse. Not that a rough spot here or there matters; only the hardest heart wouldn’t have wept at the night’s fragile, emotional peak, from “Steal Smoked Fish,” followed by “Black Pear Tree,” to “Lakeside View Apartments Suite” to “Ezekiel 7 and the Permanent Efficacy of Grace,” the night’s most musically dense number, and a note of hope. Among many gifts, Darnielle’s ability to swing from spinning metaphors about wrestling to such deep emotional fare, and back to lighter-hearted territory like “Damn These Vampires.” Despite the seriousness of the material, Darnielle’s freewheeling, conversational style with his audience makes the show itself intimate and light; especially in this seated, dinner situation, it feels like being part of a very large living room show. And, as we’ve noted before, Jon Wurster’s drums, Peter Hughes’ bass and multi-instrumentalist Matt Douglas give Darnielle a backdrop that adds discipline and welcome twists to both new and old songs. Darnielle closed with one of the band’s most poignant recent numbers, “Spent Gladiator 2.” As with “No Children,” the closer of the 4/12/15 City Winery show, Darnielle performed most of the song in the audience, circling through the crowd, singing the lyrics without amplification. That refrain, to stay alive, just stay alive, felt like both the universal plea that it is and a personal one to each of us. If you were lucky enough to be sitting there, having taken in this exceptional hour and a half, you knew life was worth living. I recorded this set with a feed of engineer Brandon Eggleston’s live mix, together with Schoeps MK41V microphones mounted on a post forward of the board. The sound quality, as with all of our City Winery recordings of this band, is exceptional. Enjoy! There are a few things you can expect at any given Robyn Hitchcock performance — namely humourous and often strange banter, a completely different setlist from the last time you saw him, and ninety minutes of entertainment. Robyn has been a profoundly influential and productive artist for the better part of four decades in a series of different bands and in many different formats. Its truly inexplicable why he does not receive the accolades of some of his contemporaries but he doesn’t seem fazed by it all. For the City Winery shows this past week, Robyn added a new wrinkle. For the November 20th shows (early and late), he promised vintage material and accepted requests, “everything considered, nothing guaranteed.” Fortunately for Andrew our taper on the scene, Robyn played his request “The Ghost Ship”, an ancient b-side that ultimately saw wide release on 1995’s You & Oblivion. The balance of the setlist drew primarily from the early catalog, including quite a few from the late-80s set of Eqyptians records. Robyn was joined midset by the Australian singer-songwriter Emma Swift, who provided ethereal backing and duo vocals, the most memorable of which was her turn in “Pale Blue Eyes” during the all-covers encore segment. Robyn Hitchcock recently announced more tour dates, which includes a return to the NYC area in January. All dates here. Andrew recorded this set with the Sennheiser compact omni microphones mounted on a stand at the soundboard area. As this was a quiet acoustic show essentially in an active restaurant, there is quite a bit of typical ambient noise. Additionally, in post-production, I had to manually reduce each burst of crowd cheering following the songs but the crowd can still be a bit overwhelming at times. With those caveats, enjoy! If you Download this recording from NYCTaper, we expect that you will PLEASE SUPPORT Robyn Hitchcock, visit his website, and purchase his official releases from the Store at his website [HERE]. Blitzen Trapper has always been a band who embraces their influences. Whether it be country-folk, 70s rock or even Zep, we’ve seen the band play some pointed covers over the years. I even had the pleasure of seeing lead singer Eric Early perform an outstanding mini-Dylan set at the Complete Last Waltz show in 2013. For this year’s Record Store Day, Blitzen Trapper took it to the next level — releasing a limited edition vinyl of a complete performance of Neil Young’s Harvest recorded live in Portland last Fall. Accompanying the release, the band went on a small tour playing Harvest along with a selection of their own material. We caught the early show at City Winery on Friday, a venue that so impressed us during last weekend’s Mountain Goats shows. Despite the still-daylight starting time, the band came out ready to play with four of the own songs right out of the gate. The set’s centerpiece piece began with the familiar opening chords of the plaintive “Out on the Weekend” (streaming below), a performance so spot-on that we knew this would be a pleasure to behold. The remainder of Harvest was equally impressive — extraordinarily faithful to the original renditions while adding a very Trapper-like flavor to each number. The rest of the set was equally well played as the band worked through a fine selection of BT classics, highlighted by the well-jammed ten-minute “Thirsty Man” and a terrific version of “Furr” that we’re also streaming below. I recorded this set with the Schoeps cards mounted on a pole about 10 feet in front of the soundboard and mixed with an excellent feed provided by the band’s touring FOH Engineer Nathan Vanderpool. The sound quality is superb. Enjoy! 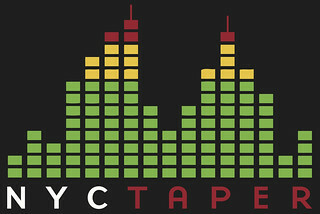 If you download this recording from NYCTaper, PLEASE support Blitzen Trapper, visit their website, and purchase their official release from the Store at their website [HERE]. There are times when the people who book shows make the perfect pairing of a band and a venue and this weekend the Mountain Goats and City Winery were a marriage made in heaven. We caught both nights with two different NYCTaper contributors but we both were in complete agreement that these were outstanding shows in large part because of where they took place. City Winery prides itself on being a “listening room” — a place where people who come to see an artist perform respect the music. There is literally a pre-show message to refrain from talking during the music. For Mountain Goats fans however, the warning may not be actually necessary. They may sing along with the lyrics (all known by heart) and call out the most obscure requests in between songs, but when the band is playing, the listening is happening. And City Winery is both large enough to satisfy the two-night ticket demand for this band, and small enough to maintain a nice level of intimacy. The Mountain Goats are currently on tour in support of Beat the Champ, which is ostensibly John Darnielle’s tribute to the early days of professional wrestling of the 1970s and early 80s. But as with the Mountain Goats music, there’s much going on beneath the surface of these songs. The basic routines that made wrestling attractive to suburban kids of the time — identifiable heroes and villains, fluid loyalties, physical comedy, and deception — are all themes that Darnielle is comfortable covering in Mountain Goats material as symbols of wider human truths. For example, the protagonist in “The Legend of Chavo Guerrero” (streaming below) becomes the “good guy” foil to Darnielle’s abusive stepfather and “Southwestern Territory” becomes a parable for the musician’s life on the road. In a lengthy show at City Winery, these and other Champ songs fit well within a career spanning setlist that offered a “gimmick” of its own. The band had played a pared-down “basement” set for the City Winery’s video series this week and enjoyed the experience so much that the actual stage plot on this night featured a small drum kit and Peter Hughes fretless bass — an “unplugged” set-up if you will. There were also some change-ups, as usual set-closer “This Year” appeared very early in the set, and “No Children” featured a complete-song vocal performance by the crowd while Darnielle led the chorus while standing on a table in the audience. Other highlights of this terrifically entertaining set included personal favorite “Up The Wolves” (also streaming below), “Foreign Object” with the outstanding horn work from new band member Matt Douglas, and a goofy acoustic cover of the Grateful Dead’s “St. Stephen” — and of course a significant amount of John’s usual humorous banter. While the Mountain Goats will not be back in NYC until next year — the current tour runs through June and then its off to Europe in the Fall — we expect that when they do the NYC shows will again be at City Winery. At least we hope they are, since this was one of my favorite tMG shows of the many I have seen. I recorded this set with the Schoeps cards clamped to the same beam that acidjack used for the previous night’s show and mixed with a superb soundboard feed by longtime Mountain Goats FOH Brandon Eggleston. The sound quality is quite excellent. Enjoy! If you download this recording from NYCTaper, PLEASE SUPPORT The Mountain Goats, visit their website, and purchase Beat the Champ from the Merge Records website [HERE]. John Darnielle possesses the writer’s gift of universality. From his very specific songs come truths that touch the hearts of listeners who have never lived his life. You may never have felt the humiliation of being a burned out tweaker, sweating it out in a dingy hotel room, but you understand what it means to feel you’re at rock bottom. You know what it is to be dumb and wild and free. You know what it is to desperately, desperately, survive a year that hasn’t gone the way you hoped. In John’s quirky new songs about wrestling from Beat the Champ there are classic themes about underdogs and alienation, themes that you don’t need to wear a mask to understand. The Mountain Goats built their fervent fan base not on the strength of riffs but on words. Listening to Darnielle’s stories, feeling the emotions he projects, his heart becomes your heart; his trials, yours. That’s Darnielle’s magic, distilled: A song about a single person that many of us could see in ourselves, even if what made us different had nothing to do with spiked heels. If proof were ever needed of the value of being yourself, Darnielle and his slow-burning but runaway success would be the best of it. That he has created an entire community of people who feel the same way is his gift to all of us. Happiness isn’t conformity, or cowing to others’ idea of who you ought to be. It’s doing every stupid thing that makes you feel alive, and the joy you feel at coming out on the other side, still breathing. Long live The Mountain Goats. I recorded this set with Schoeps MK41 supercardiod microphones in a position forward of the board, along with a stereo feed of The Mountain Goats’ engineer Brandon Eggleston’s excellent house mix. The sound quality is outstanding. Enjoy! If you enjoyed this recording, PLEASE SUPPORT The Mountain Goats, visit their website, and buy their records from their online store. No matter how many times I see Mike Doughty in a year, he’s always got some kind of a new twist. Whether an epic two-plus hours of him breaking out Soul Coughing classics solo acoustic at City Winery, or his full-on all-Soul Coughing full-band set at Webster Hall, Doughty comes up with new ways to keep his loyal fan base interest. This City Winery performance reprised another of Doughty’s fan favorites, the “Question Jar”, which is more or less what it sounds like. Doughty plays some tunes, then he answers questions fans placed in a jar. Beyond learning Doughty’s tastes in ice cream toppings and Beatles, though, what we got here was another hour and a half of Doughty at his best, this time backed by cellist Andrew “Scrap” Livingston, who added depth to songs like “Looking At the Bottom of A Well” from Haughty Melodic. A few Soul Coughing tunes were on the menu this time — probably that band’s two best-known hits, “Circles” and “Super Bon Bon” — but most of the show was dedicated to Doughty’s solo oeuvre. Some of those other highlights included “White Lexus”, “Down On the River By the Sugar Plant” and the night’s somewhat-unintentional highlight, “Busting Up A Starbucks”. Doughty’s a good-natured guy, but as we have seen in the past, he isn’t afraid to call out disrespectful fans, which he did mid-song. For the rest of us who were paying attention, it was pure comedy. I’m not sure when Doughty will come this way next, but when he does, I suspect he’ll have more tricks up his sleeve. This recording is a straight soundboard feed, which makes sense given the relatively quite nature of the material. Engineer Patrick’s house mix is outstanding. Enjoy! If you enjoyed this recording, PLEASE SUPPORT Mike Doughty, visit his website, see him on tour this fall and buy his forthcoming record of Soul Coughing songs reimagined from PledgeMusic. I arrived at this Mike Doughty show at City Winery having just finished his autobiography, The Book of Drugs. Reading Mike’s book — which tells the story of his rollercoaster experience fronting the seminal 90s cult band Soul Coughing as well as his battles with addiction — made seeing him perform Soul Coughing songs again for the first time in thirteen years all the more meaningful. As happens all too often with bands that reach a certain level of commercial success, Soul Coughing dissolved at the end of the 1990s in a bitter fight about money and songwriting credit. So Doughty — who by that point was nearing rock bottom in his abuse of drugs and alcohol — struck out on his own a solo act right when the music industry imploded. Early solo shows, where he shared material from the Skittish LP he had recorded in the Soul Coughing days, meant facing crowds howling for Soul Coughing tunes that Doughty felt disconnected from, and disappointed in. In his telling, Doughty not only felt that his bandmates denied him the credit he was due for writing the songs, but that in many cases those better-trained musicians had adulterated the intent of his compositions. So Mike stopped playing Soul Coughing songs, and the fans that weren’t open-minded or intelligent enough to dig the new material fell away. The fan base that remained, though, is fanatical. Today Mike is in a comfortable groove musically and, as the book makes clear, emotionally. What that means for fans is that Mike decided to rework some of Soul Coughing’s best-loved numbers in the way he intended them to be heard, with a full band backing him. You can purchase that forthcoming record, and keep track of its progress (including previews), on Mike’s PledgeMusic page. In the meantime, he has taken those old Soul Coughing songs off the shelf to be played proudly alongside the songs he’s been writing for the past thirteen years. While there’s no way to take a valid position on Soul Coughing’s past or songwriting process without hearing the story from all sides, it’s clear that there is a consistency to Mike’s work that has spanned his career. Stripped to their essentials, Mike’s songs are hook-driven, lyrically inventive songs filled with unique phrasing and clever observations. Even if the hooks can get repetitive once in awhile — even Mike joked that he keeps writing his favorite song over and over — a great Mike Doughty song is a great Mike Doughty song, and that voice of his can’t be replicated. This show was comprised of two hour-plus solo sets, with Mike alone at the guitar, relaxed under the lights. First we got “Janine” from Ruby Vroom, followed by “I Hear the Bells” off Mike’s best-known solo album, Haughty Melodic. Then “St. Louise Is Listening” from El Oso, one of the songs that reimagined best as an acoustic number. When Mike played “Unmarked Helicopters”, Soul Coughing’s contribution to Songs In the Key of X: Music From the X-Files, it was clear we were going to have a special night with lots of time deep in the catalog. Some of the Soul Coughing songs work better than others as acoustic numbers: Without its killer baseline and frenetic samples whirling around, “Super Bon Bon” becomes a bit lifeless, but others like “Soft Serve” and, yes, the band’s biggest radio hit, “Circles”, retain their infectious power. The solo work wasn’t to be ignored, too — Cheap Trick’s “Southern Girls” and Thin Lizzy’s “Running Back”, both of which appear on Doughty’s recent The Flip Is Another Honey, became a single song in Doughty’s live mashup. But for me, having just read The Book of Drugs, the most powerful solo numbers were the ones that told stories of darker days: “Unsingable Name”, “Sunken-Eyed Girl” and “Tremendous Brunettes”. It’d be tempting to characterize this show as one of redemption, where the prodigal singer returns to being his old self. I suspect Doughty wouldn’t see it that way; to him, when it comes to being the lead singer of the band Soul Coughing, a guy who existed 13 years ago, he’s still not that guy. And it’d be wrong to assume the artist sees playing these songs as a return to some kind of glory days, either. How you feel about Doughty’s catalog is your business, but in Mike’s mind — and to a good many of his fans — his next chapter of making music has been every bit the equal of his first, and more true to his spirit. Hearing the songs side by side, played just as he wrote them, I think it’s hard to argue otherwise. Mike will be touring as a three-piece band this fall, performing sets of all Soul Coughing songs. Tickets are available from him here. I recorded this set with a soundboard feed from Mark, the outstanding house engineer at City Winery. The recording is flawless. Enjoy! 37 Where Have You Gone?